Max. size: 4.0 cm / 1.5 inches or smaller. Origin: White Cloud Mountains in China. Temperament:Very calm and likes to be at least in pairs. Company:Will mix well with other similar sized fish. 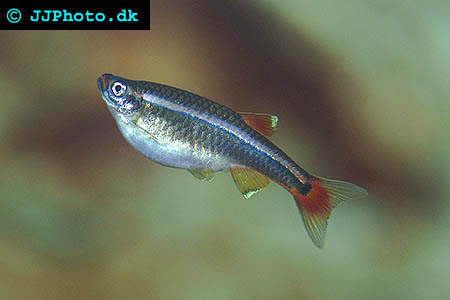 Aquarium setup: Tanichthys albonubes(White cloud mountain minnow) is kept by some people outside during summer months. Fishes that have been kept in outdoor pools over summer have more colour than the indoor fish due to the abundance of natural foods, from insect larvae to algae. It can also be kept at the lower end of the tropical scale. Feeding: They will accept most commercial foods but relish live and frozen foods. 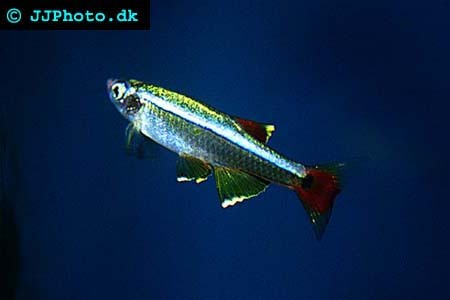 Breeding: Males are slimmer and have more intense colouration than females. Often you can separate a pair to spawn, however, some prefer to spawn the fish in schools so that the females aren't stressed as much. They are egg scatters that will readily breed and left to their own devices in a well-planted tank they will quickly multiply. However, they show no brood care.